o first, the serious stuff. 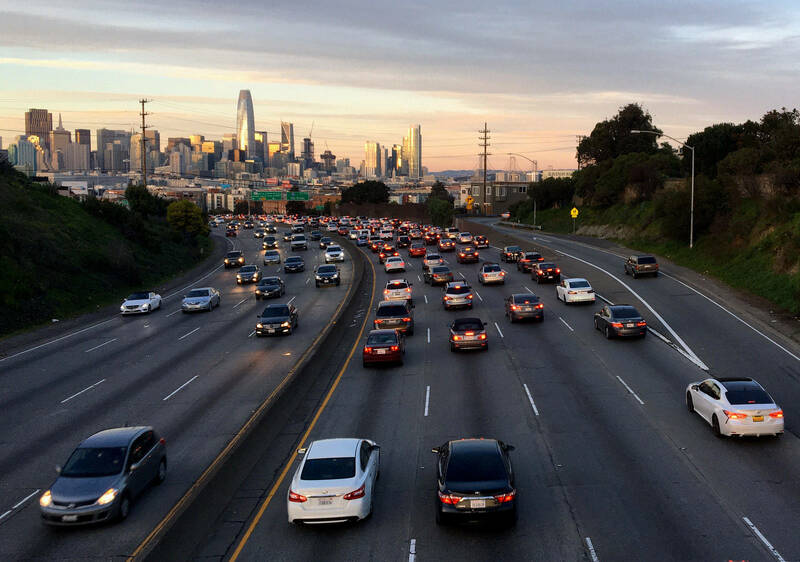 The people who keep track of how truly rotten traffic can be in the Bay Area have come out with their annual analysis of where we spend the most time jammed up watching everyone else's tail lights. The Metropolitan Transportation Commission's congestion study, released in late October, has an air of perennial predictability to it. Northbound U.S. 101 and eastbound Interstate 80, from Cesar Chavez Street in San Francisco to the Treasure Island Tunnel (roughly 5 miles). Interstate 80, westbound, from Highway 4 in Hercules all the way to the Bay Bridge Toll Plaza. (15 miles). Southbound U.S. 101 from Fair Oaks Avenue in Sunnyvale to Oakland Road in San Jose (7 miles). Northbound Interstate 680 from Scott Creek Road in Fremont to Andrade Road outside Sunol in southern Alameda County (9 miles). Three of those segments involve afternoon commutes. The one that doesn't -- I-80 from Hercules to the Bay Bridge -- is listed as congested continuously from 5:25 a.m. to 6:35 p.m. every weekday. For further exploration, the MTC posted lists of both the Top 10 and Top 50 most congested freeway segments. ow, let's step back. Yes, congestion is maddening and it's costing all of us in terms of time, money, health and environmental degradation. That's why so many of us look for alternatives to driving and support ballot measures we hope will live up to the promise of making things better. It occurred to me that maybe it's possible to step outside our little capsules of commute misery and look at our situation from a different perspective. So, with the thought that it's possible to stop occasionally and take in both the enormity of vehicular congestion and the somehow-surviving magnificence of our surroundings, here's a list of the 10 best places to see (and ponder, and wonder at) really bad traffic and the sublime scene beyond. Most can be reached by transit and/or bicycle. I'll also add at the outset that my list is very Central Bay Area-centric. I'd love to hear suggestions for cool vantage points in the South Bay and North Bay. Radio Beach, Oakland: If you're crawling up to the Bay Bridge Toll Plaza from the Oakland side and glance to the right -- on your compass, that's to the north -- you'll see a grassy, marshy area containing several radio towers. Occasionally, you'll see a car parked out there, too, and wonder how the heck they got out there. That's Radio Beach, and it gives an unparalleled view of activity at the toll plaza, of the new eastern span of the Bay Bridge and of the bay to the north. Folks go out there to fish, to walk their dogs or just to explore. One caution: There's dumping in the area. How to get there: As you approach the toll plaza heading westbound, follow the signs for West Grand Avenue/Maritime Street. At the very beginning of that exit, look for a sharp right turn that will take you onto the frontage road. The road is paved but narrow. Watch out for recently dumped trash as you drive west past the toll plaza, where there are a couple of unpaved areas to park. There is no bicycle route or transit connection to Radio Beach. Bay Bridge bike and pedestrian path, Oakland/San Francisco: The thrill here is that you can cycle or hike right alongside some of the worst traffic in the United States, all the while taking in amazing views of the Port of Oakland. The path terminates at Yerba Buena Island. For those determined to get to Treasure Island and its stunning view of the San Francisco skyline, a shuttle runs on weekends and holidays. How to get there: See 511.org for maps and directions, including information on how to reach the Bay Bridge path on transit. 18th Street/Potrero Hill pedestrian overcrossing: Everything a congestion and skyline watcher could want: drama on the U.S. 101 transition to Interstate 80 and the Bay Bridge and all those reflective skyscrapers in the distance. I'm also partial to Berkeley's Interstate 80 pedestrian bridge. 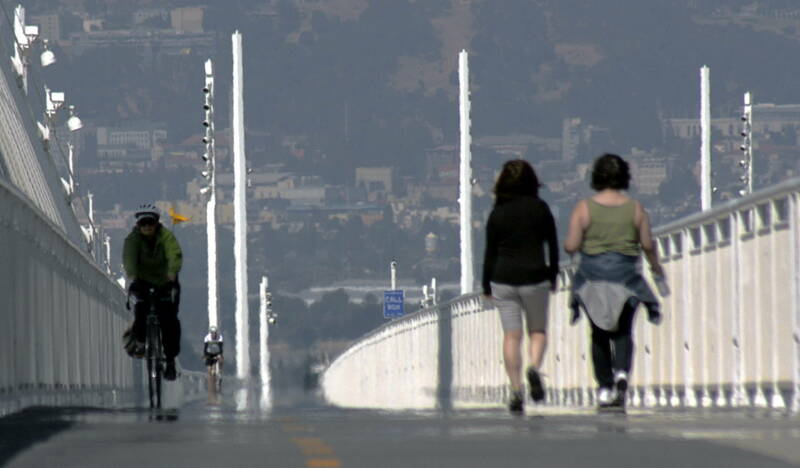 How to get there: The 18th Street pedestrian bridge crosses 101 between Utah Street on the west and San Bruno Avenue on the east. Several Muni bus lines -- the 9-San Bruno, 19-Polk, 22-Fillmore, 27-Bryant and 33-Ashbury/18th Street all run close by. Albany Bulb: Some of the best places to take in the wonders of Bay Area traffic and nature are former bayfront garbage dumps. The Albany Bulb is one such place. Long known for its serious trash-art scene, once the long-term home for many with nowhere else to live, the bulb is slowly transitioning to a state and regional park. The east side of the property, along the lower portion of Albany's Buchanan Street, features a bluff that overlooks a mud flat often teeming with shorebirds. That spot also affords congestion connoisseurs a straight-on view of an elevated section of frequently jammed westbound Interstate 80 as it merges with often equally crowded eastbound I-580. How to get there: From eastbound I-580, take the Buchanan Street exit, then turn right at the first traffic light. From eastbound I-80, take the Buchanan Street exit. Turn left at the first light onto Buchanan, then proceed straight past a second signal; the park area will be to your right. Cyclists can reach the Albany Bulb via the Bay Trail. Transit connection is AC Transit's 80 bus to Buchanan and Pierce streets. The Embarcadero, San Francisco: Maybe this is cheating a little, but what fantastic views of the bay (nature) and Bay Bridge (traffic). To take in the nature piece, stroll the entire Embarcadero from AT&T Park north. For the traffic piece, the stretch from Harrison Street to Bryant Street affords an up-close view of the bridge, with the added auditory experience of eastbound traffic pounding along the lower deck. How to get there: You'd be a fool to drive. The Embarcadero is well served by BART, Muni and ferries from the North Bay and East Bay. 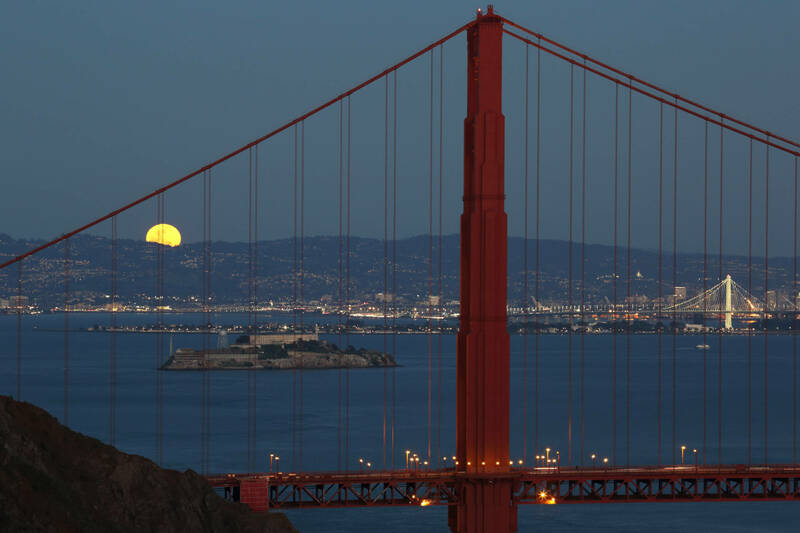 Marin Headlands: The Golden Gate Bridge is not rated as one of the region's 50 worst traffic congestion sites. But it's a symbol of the entire region, and it's plenty busy. Perhaps the most iconic views of this most iconic of bridges are from the heights along Conzelman Road, in the Marin Headlands at the northern end of the span. How to get there: The headlands are accessible by car, bike and, on weekends, transit. By car, both northbound and southbound traffic exit U.S. 101 on Alexander Avenue. Signs at the end of the ramps point the way to the headlands. Cyclists can cross the Golden Gate Bridge to access Conzelman Road, which is a steep, winding, strenuous route. Muni's 76X Marin Headlands Express, one of the Bay Area's true transit treasures, runs to and from the Financial District on weekends and holidays. Hayward Regional Shoreline: Highway 92 west from Interstate 880 to the San Mateo-Hayward Bridge Toll Plaza is rated the 32nd most congested stretch of freeway in the Bay Area. 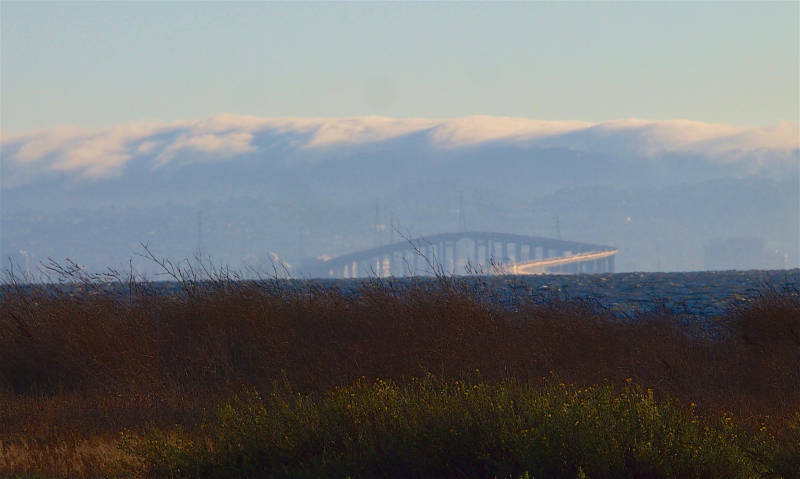 The Hayward Regional Shoreline -- featuring miles of trails through wetlands that were long ago diked and turned into salt collection ponds -- is on the north side of the freeway. The area is full of shorebirds, marshy vistas and the sound of traffic. How to get there: There are two main access points. See the Hayward Shoreline Interpretive Center site for directions from Highway 92. The East Bay Regional Park's site for the shoreline includes maps and directions for entering the park from West Winton Avenue. AC Transit's 86 bus, which runs between BART's Hayward and South Hayward stations, has a stop at West Winton and Cabot avenues, about three-quarters of a mile from the northern entrance to the park. 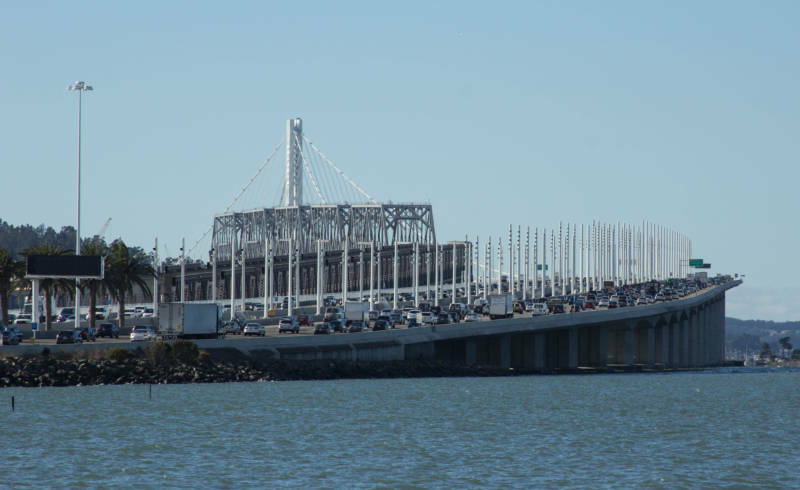 Point Molate: The westbound Interstate 580 approach to the Richmond-San Rafael Bridge ranks as the 35th most congested spot in the Bay Area. If you want to depart the jam and contemplate it from afar, Point Molate is for you. The property, accessed across Chevron refinery property, was once the site of a huge wine shipping center and Navy installation and now hosts a Richmond city park and a hunting and fishing club. 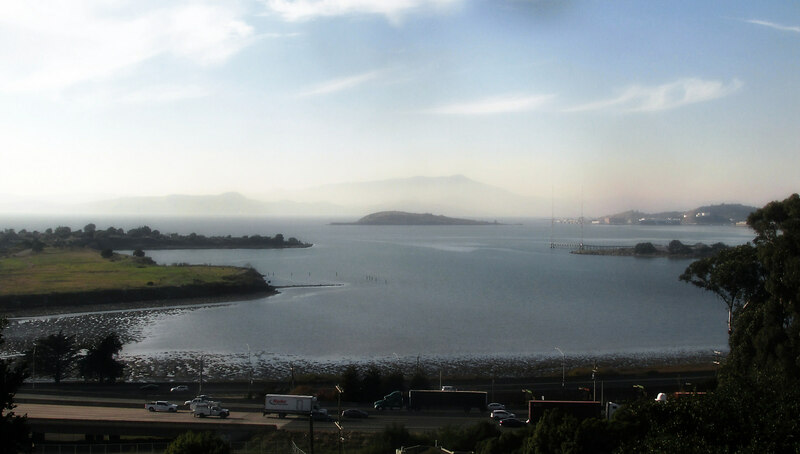 And yes -- there are great views of the undulating form of the Richmond-San Rafael Bridge, passing ferries and oil tankers, and Mount Tamalpais. How to get there: The only road access is the Stenmark Drive exit off Interstate 580, just before you get to the toll plaza. Follow the signs for Point Molate. There's access for cyclists, too -- if they're patient. 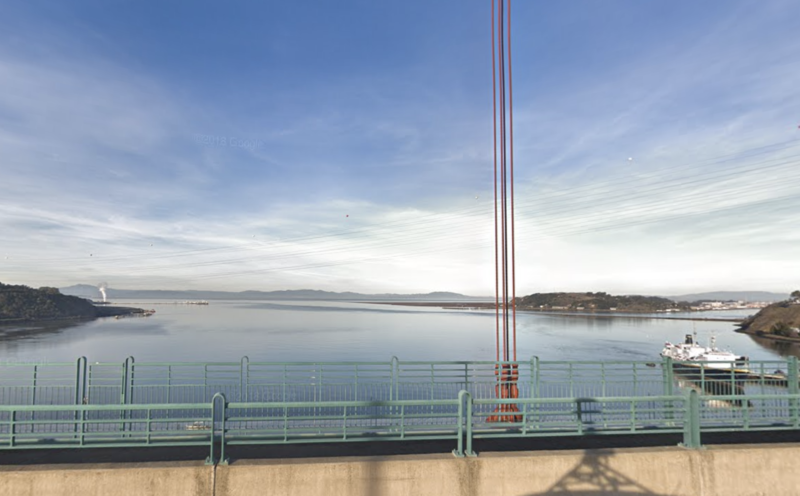 Caltrans is building a new protected bike path from Point Richmond. While it's under construction, the agency is running a bicycle shuttle to Point Molate from 7 a.m. to 7 p.m., seven days a week. Details here. Grizzly Peak Boulevard, Oakland Hills: This is a little out of the way, and it's strictly a bike-to or drive-to site, but it's an old favorite. Many spots on Grizzly Peak Boulevard open onto an amazing vista of flatlands, bay, and the city and mountains beyond. But there are a few select locations between Claremont Avenue and Skyline Boulevard where you can pull over and see not only the torrent of traffic heading to or coming from the Bay Bridge, but also cars approaching or exiting the Caldecott Tunnel on Highway 24 (afternoon commute traffic on this segment of 24 is rated as the ninth most congested spot in the Bay Area). How to get there: The easiest driving access to this section of Grizzly Peak is up Claremont Avenue past the Claremont Hotel. Turn right at Grizzly Peak, and look for places where it's safe to pull completely off the pavement. 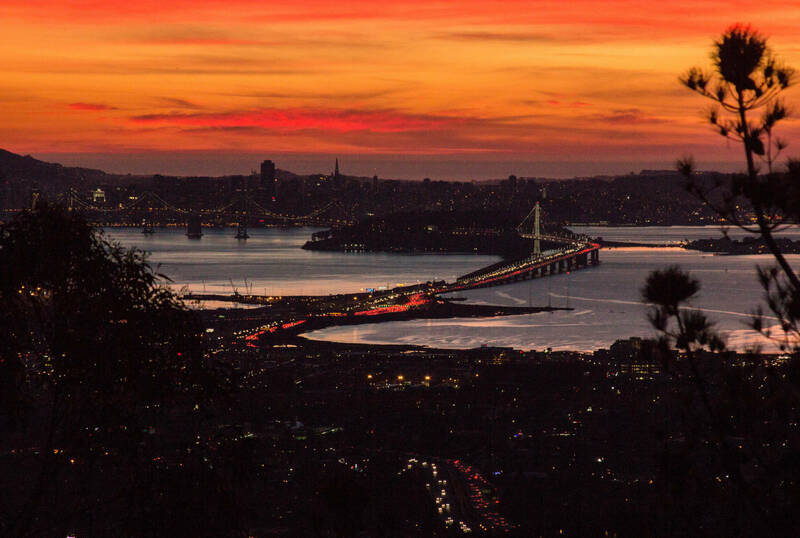 On bicycle, the best routes to Grizzly Peak are up Spruce Street in Berkeley or Tunnel Road and Skyline Boulevard in Oakland. Al Zampa Memorial Bridge bike/pedestrian path: Interstate 80 north of Highway 4 in Contra Costa County is not one of the 50 worst congestion spots. But the north end of that stretch, at the Carquinez Strait between Crockett and Vallejo, is a great spot for watching traffic and adjacent waterscapes. 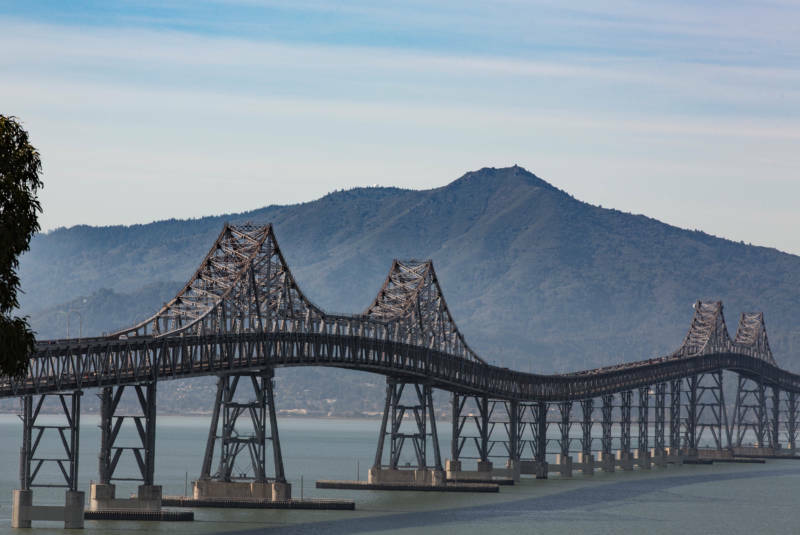 The Alfred Zampa Memorial Bridge, the southbound suspension span across the strait, includes a bike and pedestrian path from which you can watch cars pass or, more interestingly, the hill- and mountain-rimmed expanse of San Pablo Bay. How to get there: On eastbound/northbound Interstate 80, take the Crockett/Pomona Street exit at the south end of the bridge. At the end of the ramp -- San Pablo Avenue -- turn right, where you'll immediately see parking on the right. On westbound/southbound I-80, take the Crockett/Pomona Street exit and follow the directions as above. Cyclists can access the path via San Pablo Avenue on the Crockett side or Maritime Academy Drive on the Vallejo side. Carquinez Strait Regional Shoreline: Another drive-to or cycle-to spot. 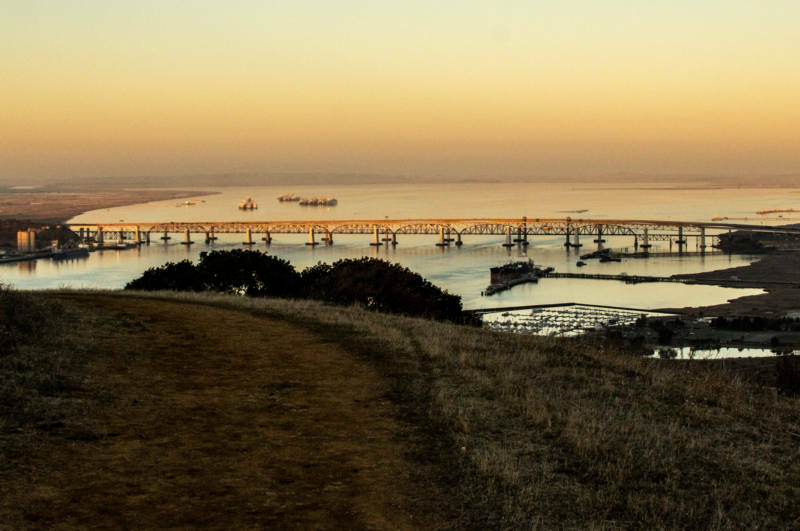 A steep creekside climb in the eastern unit of this park, just outside Martinez, takes you to a ridgetop with a 360-degree view that includes Mount Diablo, Carquinez Strait, Suisun Bay, the North Bay mountains, three nearby oil refineries and the Benicia-Martinez Bridge. How to get there: See the East Bay Regional Park's site, Carquinez Strait Regional Shoreline, for directions and maps.